Former members of the RUC police seeking compensation payments are threatening to publicly name killers who acted as informers. 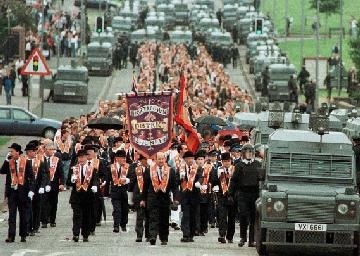 Republicans protested in Belfast city centre on Saturday at the celebration of [British] Armed Forces Day in the north. 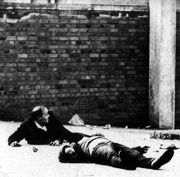 The Bloody Sunday families and the surviving wounded who were shot by the British Parachute Regiment on January 30th, 1972, have issued a statement thanking their supporters and well-wishers. A third Basque man, arrested in Belfast city centre on Thursday night by the PSNI, is being held on foot of a Spanish extradition bid. 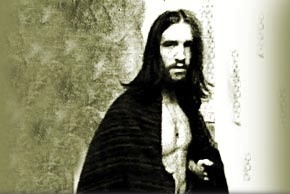 The death occurred in Belfast recently of well-known republican activist and ex-PoW Seando Moore. The geographical and symbolic position of St Matthew’s Church, facing on to the staunchly loyalist Newtownards Road, played a major factor in the events which were to unfold in June 1970. The Saville report has underscored the difficulty of “truth and reconciliation” inquiries. The Dublin and London governments have formally begun the process of arranging a state visit to the 26 Counties by the ‘Queen of England’ Elizabeth Windsor, it was announced yesterday. 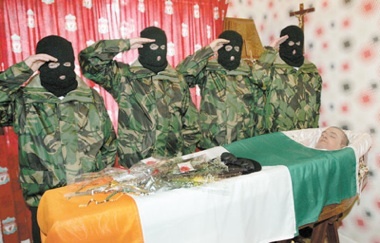 The son of a murdered Sinn Fein activist has become the first person in almost 30 years to be charged in connection with a republican funeral. Loyalists have carried out a series of racist and sectarian attacks in south Belfast. US President Barack Obama has told British prime minister David Cameron that his Bloody Sunday apology was “historic” and would contribute to reconciliation in the north. A total of 31 overseas trips were funded from a controversial multi-million euro “training fund” which was shared by trade union officials and public servants. Gerry Adams told Fine Gael leader Enda Kenny at Stormont yesterday that Fine Gael was not trusted on the “national question” after the Fine Gael leader said he would not enter into a coalition government with Sinn Fein. Both North and South have failed miserably as separate entities. 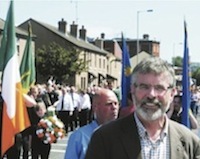 The best way forward is to avoid the wastes and inequalities of partition, writes Gerry Adams. Protesting republican prisoners in Maghaberry jail in County Antrim have begun a dirty protest after prison authorities refused to implement an agreement made with the prisoners to address their concerns at the conditions. Lawyers representing some of the Blood Sunday victims’ families are to meet the Public Prosecution Service about prosecuting the soldiers responsible. A thirteen-year-old girl was knocked out and lost her front teeth when a brick was thrown by loyalists over a west Belfast ‘peaceline’. 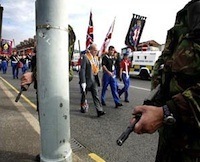 Nationalist politicians have accused the Orange Order of holding the community to ransom over fears that it will attempt to stage an illegal Drumcree march. No group has claimed responsibility for a 300 pound bomb which failed to detonate outside the PSNI base in the border village of Aughnacloy, County Tyrone. It would be a mistake to see Saville's report as supplying the definitive answers to what happened on January 30, 1972 in Derry. 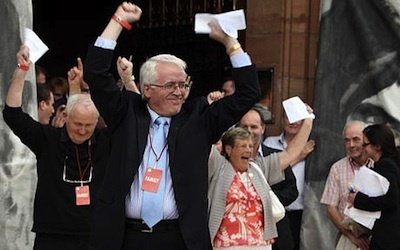 Derry is still dizzy from the eruption of joy which greeted the Saville report’s recognition on Tuesday that all of the Bloody Sunday wounded and dead were unarmed civilians gunned down by British paratroopers for no good or legitimate reason. Suppressed for 38 years by the mendacity of the British Army and its soldiers, the facts of the bloody massacre of innocent Irish nationalists in Derry in January, 1972 have been affirmed by a British tribunal of inquiry and publicly accepted by a British Prime Minister. 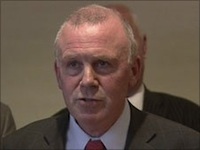 Sinn Fein’s Deputy First Minister Martin McGuinness complimented the Conservative British Prime Minister David Cameron on a “generous” statement in which he apologised for the Bloody Sunday killings. A shakeup of the north’s local councils has collapsed after the Six-County executive failed to reach agreement . How the Saville and Widgery reports differed in their findings for each of the Bloody Sunday victims. The first five chapters included in Volume One of the report of the Bloody Sunday Inquiry, published this afternoon, which outline the events of the day, addresses the question of responsibility for the killings, and provide an overall assessment. Relatives of the victims of the Bloody Sunday massacre have entered the Guildhall in Derry after retracing the route taken by civil rights marchers in 1972, and have begun examining the findings of the Saville inquiry. The people of Derry and campaigners for the victims of Bloody Sunday across the world are eagerly awaiting the findings of the Saville Inquiry this Tuesday afternoon. Fine Gael leader Enda Kenny has sacked Richard Bruton as the party’s finance spokesman and deputy leader as speculation mounts of a looming leadership challenge. The Israeli announcement that former Ulster Unionist leader David Trimble will take part in an internal investigation into its murderous assault on a convoy of Gaza-bound aid ships has been greeted with disbelief in Ireland. On Tuesday, the Bloody Sunday Inquiry will publish its 5,000-page report into the mass killing of protesters in 1972, an event that was unique among Troubles atrocities and that changed the North profoundly. The 26-County Taoiseach Brian Cowen is facing a motion of no confidence in the Dublin parliament after his government was harshly criticised by two preliminary reports into the banking crisis and linked to an attempt to falsify the financial position of Anglo Irish Bank. Israel targeted an Irish aid ship heading for Gaza last week despite continuing outrage over the bloody assault on the main humanitarian relief flotilla, which left nine aid workers dead and stunned international public opinion. The leadership of Republican Sinn Fein (RSF) admitted this week that a recent convention of local leaders of the Continuity IRA has sought to form a breakaway republican armed group. It described the meeting as “unauthorised”. The opening on Saturday of the M3 motorway past Tara, the ancient capital of Ireland, was a day that heritage campaigners had hoped would never come. A 41-year-old Derry man shot dead by the British army in 1971 was an innocent victim and was not carrying a rifle, as claimed by the soldier who killed him, the Historical Enquiries Team (HET) has found. A major row has erupted between Sinn Fein and former party councillor Dessie Ward following his resignation from the party. 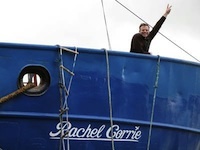 The Flotilla was an heroic effort to highlight the imprisonment of one and a half million people by the Israeli state and the humanitarian crisis that the siege has created. PUP leader Dawn Purvis has resigned after a campaign of intimidation by the unionist paramilitary UVF has seen it issue death threats against its critics and a message of terror against the people of the Shankill Road. Colm Murphy, whose conviction in regard to the 1998 Omagh bomb was overturned and who was subsequently cleared of criminal charges, has accused an alleged British agent of attempting to frame both himself and his son. Senator Ivor Callely is set to be expelled from the Fianna Fail parliamentary party after a formal investigation was opened into his expense claims. Did Israel deliberately kill civilians? There is clear evidence present that the State of Israeli may have deliberately and with forethought intended to provoke a conflict in order to assassinate civilians sailing aboard the Freedom Flotilla, and therefore violently discourage any further attempts to deliver humanitarian aid to the Palestinians of besieged Gaza. 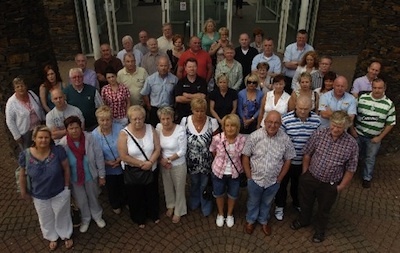 Has any politician - unionist, nationalist or republican - stood up and said UVF decommissioning was clearly a fraud?